Torben Kuhlmann was born in Germany in 1982. Highly creative as a young child, Torben was recognized as early as kindergarten for being a gifted draftsman. He was captivated by small airplanes, strange machines, and steaming trains; these elements made their way into his drawings. He studied illustration and design at the Hamburg University for Applied Sciences. His preferred media are pen and watercolor. He also works with acrylics, oil paints, and digital programs. He works as a freelance illustrator in Hamburg. His books Lindbergh: The Tale of a Flying Mouse, Moletown, and Armstrong—The Adventurous Journey of a Mouse to the Moon quickly became best sellers and owe their inventiveness to Torben’s great enthusiasm for unusual mechanical inventions. 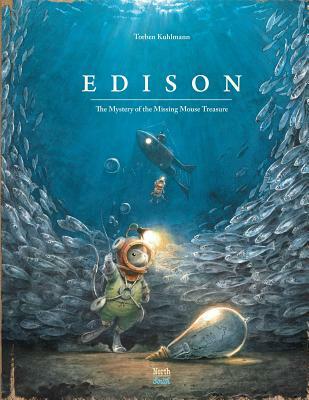 Edison —The Mystery of the Missing Mouse Treasure is his fourth picture book for NorthSouth Books.